We are delighted to offer the Achromat Lorgnette II from Alan Lewis. If you've never used a stereo viewer with achromatic lenses, you'll be amazed at what you've been missing! 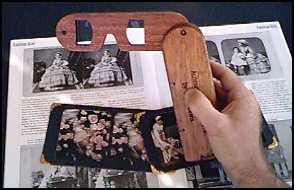 Conventional Holmes format print viewers, whether using glass or plastic lenses, cannot compare to the wonderful, sharp and clear stereo image that the Achromat Lorgnette II produces. When you use this viewer, you'll enjoy sharp, color corrected, and distortion-free 3D images from your Holmes format stereocards. You will see details in your stereoviews that you never knew were there. Antique stereoviews look superb through an achromatic viewer. The black and white image will be just that, you will not have any color fringing towards the edges. The image will appear sharper and much clearer. Your new stereoviews can finally be viewed with a quality instrument. You will be able to accurately judge the quality of your image without the added distortion and color fringing caused by conventional lenses. You may be very surprised by how good your stereoviews really look! You'll also be able to accurately judge the quality (or lack thereof) of digital output devices. Most other viewers are not good enough to reveal the shortcomings of digitally printed stereo images. With the Achromat Lorgnette II you can marvel at all your stereocards with renewed wonder. You can also use it to view stereo images printed in magazines and books, or to study stereoviews you are considering buying at shows. The Achromat Lorgnette II uses a 200mm focal length coated achromatic lens. This is the same magnification as an antique Holmes stereo viewer. Additional pictures and details available.